SAMINA production center is located in Frastanz in the Vorarlberg region of Austria, immersed in nature with magnificent views of the snow-capped Alps. This is where each SAMINA product is born. Beginning as valuable unprocessed raw materials that meet the highest standards and are subject to the most stringent controls, then assembled into shapes and forms for the healthy sleep product line. T. Hand-crafted in the pristine clean air and almost holy quiet of the mountains is where traditional craftsmanship ensures each SAMINA piece is gently prepared, carefully produced and perfected with a love of detail. Everything that surrounds you in bed is close to you. This means we have a responsibility. In the manufacturing, we only use materials that meet the highest quality standards –pure, natural, organic, minimally-processed raw materials including virgin sheep’s wool from the finest merino sheep from the Lechtal valley in the Allgäu region in Germany. We also use untreated solid, abrasion-resistant, pliant ash and hard, robust beech from local forests. Natural rubber extracted by hand and processed into Talalay quality. The finest organic cotton and organic ceramic fabrics. "A good laugh and a long sleep are the two best cures for anything!" After shearing, the sheep’s wool is gently washed before it is carefully processed into wool fleece and other fabrics approved for use by SAMINA. They do not process the solid wood used for slats or frames. During traditional industrial manufacturing, the natural properties of the raw materials are destroyed by machines. SAMINA believes in the power of nature – and a gentle, manual manufacturing process in order to retain it. This is the only way for the valuable properties of the materials to remain pure – and it allows us to offer a product that enables you to enjoy sleep in its purest form: healthy, ecological and sustainable. The products SAMINA produces are all unique one-offs. 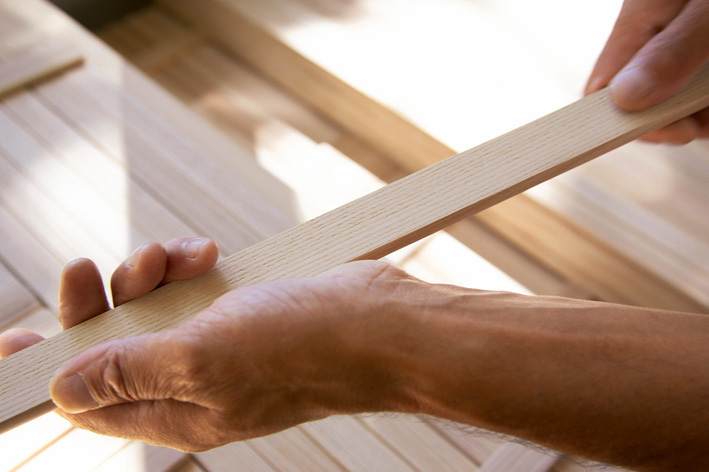 Each individual slat made from pliant ash is tested for quality and carefully integrated without glue. Each topper, each blanket and each pillow is filled by hand and finished using an elaborate cross stitch in our own sewing room. This allows us to prevent cold bridges (gaps) like those in traditional square,inflexible lock-stitch seams. SAMINA has been making their products in Frastanz since 1989. They have already managed to inspire more than 300,000 customers with SAMINA products. Being responsible in dealing with natural resources is very important to all of us, and in 2015 they opted for climate-friendly and CO2-neutral production processes: from the extraction of the raw materials and the manual production process to the delivery to our customers. Each and every one of us working with SAMINA believes in the work we do each day. We would like to convince you, too. In person, if possible. Come to Frastanz – magnificent Alpine panorama included or come to Pasadena where we can offer you lovely views of the San Gabriel Mountains. Either way, we look forward to hearing from you.